I think they are really cute and I bought them for my kids when they were little, but I don't really like them. 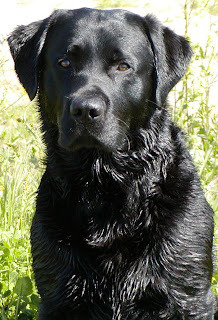 When they are soft spring showers, yes. Rainstorms...not so much. 4. When I was randomly flipping through TV channels this week, a show in which tattoo parlor employees received tattoos of a co-worker's face on their bodies. I can't imagine having a portrait of a colleague tattooed on me. But if someone forced you to receive a portrait tattoo (face only) of anyone, who would it be? Why? My husband, because I love him and always will. Neither, but if I had to do one, probably a nose ring, because I could take it out. Just church for sure. After that, who knows! I don't know. I think an early morning sky. Maybe about 3. I'm not sure. Depends on what the color is on. Maybe yellow. Click on the Random Dozen button above to join in on the fun. Oh, and I'm really excited too. There were 5 comments on the giveaway post, but only 4 entries. Guess who the 5th comment was from. The author of the book! Liz Curtis Higgs! I think that is so awesome that she took time to read my review and make a comment. Man, I love this lady! Have a great day everyone and congrats to Mimi and Robin!!! Join Amy at Signs, Miracles, and Wonders for more TSMSS. This is the first time I've heard this rendition of this song. I hope you enjoy it. Book Description from Back Cover: A mother who cannot face her future, a daughter who cannot escape her past. Lady Elisabeth Kerr is a keeper of secrets. A Highlander by birth and a Lowlander by marriage, she honors the auld ways, even as doubts and fears stir deep within her. A timeless story of love and betrayal, loss and redemption, flickering against the vivid backdrop of eighteenth century Scotland, Here Burns My Candle illumines the dark side of human nature, even as hope, the brightest of tapers, lights the way home. My Thoughts: I love this book. It is very well written and I love the story line. The characters were a little confusing to me at first, but it didn't take long to get them figured out. My favorite character is, Lady Elizabeth. She is so sweet and so brave and I truly enjoyed her. It was fun trying to read the words the author wrote in the Scottish dialect and trying to imagine how they would sound. That just added another fun element to the book. I also enjoyed the fact that this novel is loosely based on the book of Ruth, one of my favorite books in the Old Testament. As you read the story, you can't miss the similarities. Now I can't wait for the second book in this series to come out so I can see what happens next. I would highly recommend reading this book. Here's a trailer for you to view, if you'd like. Giveaway: I was given a free copy of this book to give away. So if you are interested in having a copy of this wonderful book, just leave a comment and a winner will be drawn on Monday, March 29th. Actually I'll give away 2 copies (the new one and the one I read). Linda at Second Cup of Coffee is busy this week and so SouthLakesMom from I Didn't Know THAT! is hosting. The theme is Spring . . . and any other random questions that crept in. I've been on a couple of cruises and when we were on the islands they told us not to drink the water or even have drinks with ice in them. So we either drank bottled drinks or we waited until we were back on the ship. Depends. Sometimes not any and sometimes 8 or so. 9. March 24 is the birthday of Harry Houdini. Have you ever watched a professional magic show? Share. I have watched some, but for some reason, I really don't like magic shows very well. I really don't know why. I don't much like gangster movies, but westerns are fine. I love John Wayne. All of them. lol But I'd love to go to Alaska and Hawaii...and for some reason, I'd love to visit Texas. Maybe because it seems so many of my blogging buddies are there. Trish has a giveaway on her blog you really should go check out. She's celebrating her upcoming 1st blogaversary. You'll love the giveaway and if you spend some time reading her blog, I think you'll love that too. Go check Trish out at Me & My Boys...our life, one laugh at a time. I promise you won't be sorry you did. I received this story in an e-mail from a friend and just had to share it here. Hope you enjoy. The egg had been fragile. Its thin outer shell had protected its liquid interior, but after sitting through the boiling water, its inside became hardened..
Our family is going through some tough times right now, but I can say without any doubt this song is true in my life. I hope it blesses you like it has me today. And I thank each one of you that have been praying for us. God is so good to allow me to have friends like each one of you. 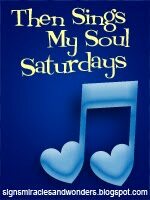 Click here to join in with others participating in Then Sings My Soul Saturday. Mocha with Linda has started a new meme called Flashback Friday. This is week 2. 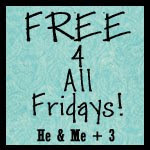 Click here if you'd like to go visit Linda and read more Flashback Friday posts and/or join in on this new fun meme. Today's prompt says: "While not all of the Flashback Fridays will be "firsts," this week's topic falls into that category. Turn back through the pages of your life to your memories of dating and tell us. . . When was your first date? You can choose either your first date ever or your first date with your spouse - or both! How old were you? What did you do/where did you go? Did anything memorable - either good or embarrassing? If it was your first date ever, did you continue to date that person? If so, how long? If you are sharing the story of the first date with the person you married, did you know he/she was "the one" or did it take a longer for love to bloom? Any other memories you wish to share about those wonderfully awkward first dates?!" Our (Tracy's and mine's) first official date was in 1988. We actually had gone out with his mom and dad and brother & sister-in-law to the Festival of Lights at the Cincinnati Zoo, but we've never called that our first date. Anyway, Tracy was the minister of music and choir director of our church and when I started going to that church I joined the choir. I sang in the choir for almost a year before he ever talked to me. Anyway, we went to the zoo around Christmas with his family and then in January 1988 we had our first date. My sister and I lived in an apartment together with another friend. Anyway, we got a friend of Tracy's who also sang in the choir to invite Tracy to come to our apartment to have dinner and that I would make lasagna for everyone. Now mind you I was 30 years old and I didn't have the nerve to ask him over. What's that say about me and at that time, Tracy was a very quiet and shy kinda guy. I'm not sure how he ended up in the ministry, except he was just obedient to God. Anyway, that night the 3 of us girls who lived together were there and then Tracy came and so did the friend that asked him for us, along with his wife and their 2 kids. Everyone was so nervous, except for Tracy (or he just hid it really well). I mean, the guy who asked him was so nervous that he ended up putting his kid's shoes on the wrong feet. It was hysterical. We've laughed about that night so many times since then, but evidently he liked my lasagna and maybe me too because a year later we married and we've been married 21 years now. This highly anticipated companion to Do Hard Things is filled with stories and insights from Alex and Brett Harris and other rebelutionaries who are making a difference right where they are. Start Here is a powerful and practical guide for young people who are ready to blast past apathy and “do hard things” for the glory of God. Alex and Brett Harris are the coauthors of the best-selling book Do Hard Things, which they wrote at age eighteen. Today the twins speak regularly to audiences of thousands on The Rebelution Tour, maintain a hugely popular online presence through their blog, TheRebelution.com and have been featured on CNN, MSNBC, NPR, and in the New York Times. Raised in Portland , Oregon , the brothers currently attend Patrick Henry College in Virginia . My Thoughts: I really enjoyed this book. I'm hoping my girls will chose to read it too. It has such great stories about teenagers taking the risk and doing hard things for God. It's definitely very inspiring and is making me rethink things in my own life. It gives steps and ideas about what hard things you might do and how to go about getting started. My favorite parts were all the stories about kids that have actually stepped out and done something hard. They also talk about how to keep the right attitude and how to be humble when you are being praised for what you have done. They use scripture to make their point and they actually do a very good job of it. If you have teens, I would highly recommend this book. Actually, you might want to have them start with the first book Do Hard Things first. If you are interested in obtaining a copy of this book, you can click here. A copy of this book was provided for review by Random House. Check in with Linda at 2nd Cup of Coffee if you'd like to play along. I don't believe I am at all. Sometime between 7-11pm. Not the whole time, but sometime during those hours. Okay for some reason these are really hard for me. I don't have an answer right now. I always did in school, not so much now. I think it would probably be different every day. Sometimes I'd waste it playing on the computer, sometimes I'd read or play the piano, sometimes I'd spend extra time with the Lord, sometimes I'd take a walk, sometimes I'd sleep, sometimes I'd just sit and talk with my hubby. One thing I'm pretty sure I wouldn't do is work or clean my house. My husband is right here beside me. He is my best friend and the most wonderful man ever created. I love him with all my heart and I hope I don't take him for granted too often. This has been a time of testing in our life this last few weeks. But God is faithful and helping us. He is teaching me plenty and I'm trying to listen and learn. He has given us scriptures to hold on to and I believe in time these issues will be resolved. In the mean time I plan to stay on my knees before the Lord and in His Word trying to hear what He's telling me. Thank you for being patient with my absence this week and my plans are to be back real soon. Your prayers on behalf of my family would be greatly appreciated. My friend sent me an encouraging e-mail earlier this week telling me to just keep breathing. She said sometimes that's the hardest thing to do. She's right...but when I get upset, that's what I remember, just keep breathing and God will see you through. I'll be back soon...Lord willing. Thought I'd share with you what's posted on our bathroom mirror for encouragement to me and hubby. Hope it encourages you too. Good morning...this is God. I will be handling ALL your problems today. Thanks, but I don't need your help. Have a GREAT day! Heidi, send me an e-mail and I'll get the book and your gift out to you in the next couple of days! Congratulations!!! I've met a new friend recently and we were talking after church last night. She told me they lost their 13 year old daughter to cancer a couple years ago. You know I really didn't know what to say when she told me. I can't even imagine what that must be like. But she said she had noticed during church that my youngest daughter and I were holding hands for a short time. She said it reminded her so much of her daughter. And in her saying that it made me think that I really need to enjoy these days and times with my girls. They won't always be here. I pray I will never lose them to death in my life time, but we don't know what God has in store for us. But I do know that one day (and it really won't be that long) they will move out to start their own lives. I know I will miss them and I know I need to make as many memories as I can now. Now Lord willing when this happens, they'll come home often, but God could call them to a far away land, like he has so many people. I think this was just a real wake up call for me. Lord help me to remember and help me to love my girls while I have them at home. Help me to treasure each moment you give us together. And this is the prayer my husband and I pray almost nightly for our girls. Lord, I ask you to place a hedge of protection around our girls and to open the eyes of their heart to see You more and more. 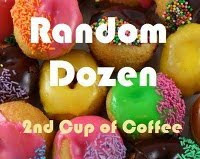 Here are the Random Dozen for the first week of March!! 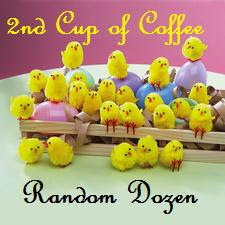 Go join Linda at 2nd Cup to play along or to read more. I don't remember ever really thinking about this before. Probably even because who wants to be the odd man out? Depends on which day of the week it is....probably about a 3 or so. I don't believe in luck, but I am extremely blessed! I don't know. I can't remember yesterday, how can I remember that. Probably pretty good, unless I want to be fooled then I can believe it's real. Not near as good as I should be, but probably about as good as I'm gonna' be. I can't say I really have one, but what popped into my head was "I Can Only Imagine"
I'll pick up any coin, even pennies. Do it all the time. Hubby and I always say that makes our next Disney vacation 1 penny closer. I hoping to see sunshine. Don't forget to enter the I Win...You Win Traveling Book Carnival. You have until Thursday night at midnight. Giveaway announced on Friday. Click here to enter. I received this e-mail this week and loved it and wanted to share it with you. Hope you enjoy. in a very secluded, rural area. started to growl, and wouldn't let him pass. Don't forget to enter the I Win...You Win Giveaway below. We have a fun carnival going on called “I won... You win". This is a traveling book carnival, started by none other than Robin at Be Still and Know. This is a wonderful idea, and it is a lot of fun. I was the lucky recipient from Nel at Fastenau Facts. Along with the book she sent me several neat little goodies. See. The book we are sharing is “Sisterchicks in Wooden Shoes” by Robin Gunn. It is a fun book and an easy read. Robin, our blogging buddy chose this book because of the parallels between pen pals and blogging pals. You can read her original post here. I received this on Wednesday and finished reading it (and I ate the last chocolate too) on Saturday. Awesome book. I love all the Sisterchick books I've read and I think you'll love it too. (Oh and by the way, I did share the chocolates with my family). * As you read feel free to make notations in the margins of a specific chapter that you enjoyed or ideas that you agree on. Leave your footprints in the book. * When finished write the date and your blog address on the inside cover of the book. * Continue the “I won... You win Giveaway". Post it on your blog and accept entries. Surprise everyone and include a pretty bookmark or a special little gift, something from you in your mailing. * Link back to Robin and let her know your Giveaway is up and running. She is keeping a running list on her blog. * Last but not least, Have Fun! Now for the Giveaway: If you would like a chance to read this book, receive several goodies and agree to abide by the above rules it is easy, all you have to do is leave me a comment on this post and your name will be included. The last day to comment will be Thursday, March 4th.. I will draw Friday morning and will announce the winner sometime Friday. Good Luck Everyone! I've decided to add a couple more ways for you to get extra entries. If you already follow my blog or sign up to follow my blog, leave another comment on this post saying so and that'll give you an entry. Also, if you write a post on your blog about this giveaway, leave a comment and that will be another entry and one other way to get another chance would be to Twitter this giveaway and then leave me a comment. So in all, that's 4 ways to get entries for this book.